Bella Nico is a diversified company that privately labels frozen Vegetables, frozen Italian Entrees, frozen Ravioli/Tortellini, frozen Italian Beef, frozen Soups, and Pasta Sauce items at retail. Originated in 1995, Bella Nico, Inc’s main objective is to produce quality items in a niche category. When was the last time you got excited about frozen vegetables and pasta? Bella Nico has been a family brand to many, but had trouble gaining market share outside of its loyal customer base. We needed to make their product exciting again. 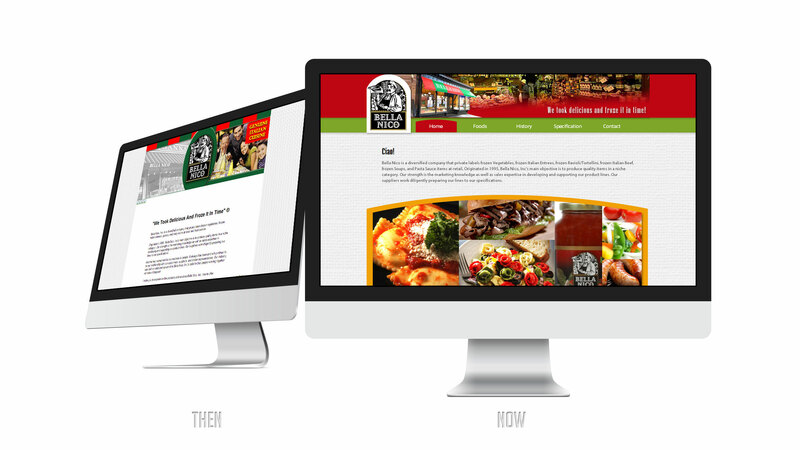 With a limited budget, we turned to digital to build their brand assets. Inspired by the product’s Italian roots, we introduced a variety of exciting colors. We wanted Bella Nico to be the first and only colorful, cheerful and authentic Italian brand of frozen food products. We focused on creating a whimsical yet perceptive website for Bella Nico. The website is read by consumers and food distributors alike. With 60+ products under its brand, we created an elegant website layout to organize the merchandise. Shoppers can instinctively find what they are looking for or explore new products by navigating the website.